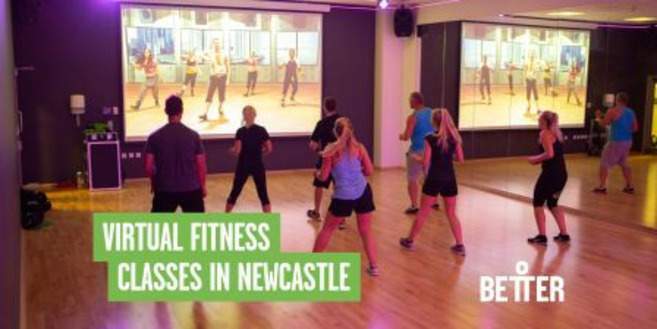 Better, Leisure Centres in Newcastle, managed by GLL, the UK’s largest leisure social enterprise, will soon be introducing even more variety and choice to their fitness class timetables, when they introduce virtual sessions from December 2018. East End Pool in Byker, Walker Activity Dome, Eldon, Gosforth and West Denton Leisure Centres, plus Newcastle Trampoline Park and Gym on the West Road are all set to take part in a revamp of their programmes, which will see classes available from when the buildings open, right through to closing time. 167 fitness classes are currently available across the city and the intention is to increase this by up to 50%. Existing sessions and attendance levels will be reviewed to ensure the range of classes meets customer demand, increasing the number of popular classes and introducing new sessions into the mix including, Insanity, Zumba, Yoga, Pilates and 30 minute HIT classes. Class length will also be varied to fit in with member’s busy schedules, from short, sharp 10 minute sessions to 80+ minute workouts for those with more time on their hands. Virtual classes will be included as part of Better, health and fitness memberships and customers can either book online in advance or just turn up and take part. “Our instructor led sessions will still be on offer for customers who prefer traditional classes and centre staff will be running some initial demonstration classes to show customers how to use the virtual system; we would encourage customers to come along to these”. The new timetables will begin from Saturday 1st December 2018; for more information or to book, visit www.better.org.uk/newcastle and click on your chosen centre. Check out the short demo videos below to get a flavour of your new virtual classes.